Rory McIlroy’s bid for a hat-trick of titles ended in frustration and defeat at the Radisson - SAS West of Ireland Championship at Rosses Point. 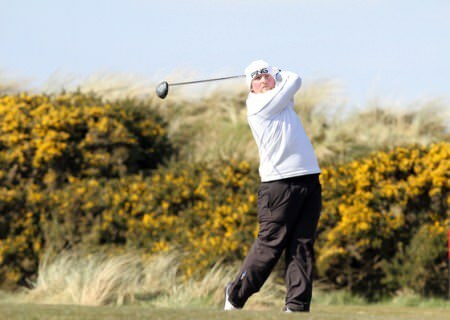 The unbackable favourite was beaten by one hole in the quarter-finals by Irish Boys interntional Paul Cutler from Portstewart. But McIlroy’s defeat was only part of the story on a day when Strandhill’s Tommy McGowan sent the local support into raptures by making it into the last four with a pair of 18h hole victories. Out of sort with his putting all week, McIlroy cruised into the last eight with a 4 and 3 win over Rory Leonard of Banbridge in his morning match. But he paid the price for some erratic putting against 18-year-old Cutler in the afternoon as he twice squandered two-hole leads before falling at the last. The world’s second ranked amateur was understandably upset to have let the title slip away and with it the chance to match the late Joe Carr’s feat of 1962 by recording a third successive victory. Bogeys at the 14th and 15th left matters in the lap of the gods and Cutler proved that he has the cool to go all the way this week when he got up and down for a half in par at the 16th before chipping stone dead for a conceded birdie at the last. McIlroy had an eight footer to take the match into extra holes but he pulled his effort wide of the target and bowed out of the championship. Cutler was delighted with a victory over the reigning European champion he described as “unbelievable”. But while the McIlroy’s defeat would normally have ended local interest in the championship, they are sure to come out in droves today to support McGowan, a fifth year student at Summerhill College who is only playing in the event on a special exemption from the Connacht Branch. The 17-year-old sank a 20 footer for birdie at the 18th to beat Lee Valley’s Niall Gorey by one hole in the third round and then produced the biggest roar of the day when he hit a 197-yard four iron to six feet at the 17th and rolled home the putt to go one up against England’s Jonathan Hurst in the quarter-finals. Hurst lipped out with a birdie effort at the 18th that would have extended the match and McGowan admitted that he was floating on air all day. South of Ireland champion Simon Ward is now the favourite to win the title after a two hole win over Banbridge’s Richard Kilpatrick in quarter-finals but he will need to be at his best to see off 34-year-old Joe Lyons from Galway today. Lyons was seven under par for the holes played as he thrashed Newlands’ Andrew Hogan 7 and 6. “He stitched everything,” said a shellshocked Hogan, who was level par on his own card. A Hogan (UCD/Newlands) bt P Murray (Limerick) 21st..
J Lyons (Galway) bt A Hogan (UCD/Newlands) 7/6. (8.15) S Ward (Co Louth) v J Lyons (Galway). Schoolboy hero Tommy McGowan grabbed the glory in the SAS West of Ireland Championship as top gun Rory McIlroy crashed out.